The button question was very, very close – as of right now it’s 19 for the gray, 24 for the tortoiseshell. Tough, tough, and I must say the gray button advocates were pretty persuasive. What shall I pick? Well, I still haven’t sewn them on yet so you’ll have to hold tight! Today I did 3 loads of laundry, my dad bought my mattress and sofa to be delivered next week, I ordered my internet to be hooked up next week as well, packed my stereo, most of my important desk stuff, books, camera equipment, spinning wheel and graphics tablet (a few other things along the way too). Packed up some stuff for shipping and printed my comprehensive list of Stuff I Need. I didn’t post before before because there seemed an overwhelming majority for the tortoiseshell but I loved the grey – I thought the colors complimented each other. And I love the new design! Can’t wait to see it released. Very cute! The pattern on the neck band reminds me of little chromosome pairs. Lovely! It sounds like you’ve done more than enough to warrant a break. That shrug is terrific, Laura. I will definitely need to buy myself that pattern. My 2 cents worth re buttons is go with the grey. The tortoiseshell ones look really brown against the pink ( at least on my monitor) I just find them jarring. The grey/pink combo seems more complimentary. 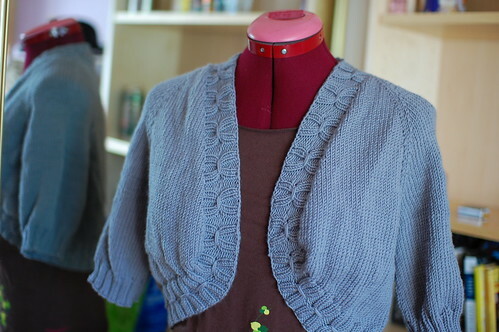 I love this shrug and look forward to the pattern! Best of luck with your unpacking. I love that blue shrug! When will you be publishing that pattern?